In this year’s sole RCV contest, only 4% of the ballots were exhausted, meaning they did not count in the final pass to determine which candidate won. There were only three candidates on the ballot, and just two passes were required to determine the winner. Three quarters of Chun voters made a second choice. Binder’s polls and Phil Matier’s residency story gave informed Chun voters a heads up on the need to get ready for a second choice. What about contests without horserace polls or those with large candidate fields? In the District 5 2004 supervisor contest with 22 candidates, 26 percent of the voters had their ballots exhausted by the time Mirkarimi crossed the finish line. In the affluent District 7, which also sported a large field of candidates, 23 percent of those who voted had their ballots exhausted by the final pass. Frontloading of the endorsement process is a particular problem when groups fail to endorse one of the two finalists. Slate cards without 1, 2 and 3 rankings don’t reflect what is possible, and the endorsement hinges upon the success of the first place choice. Groups that endorsed Howard Dean early in 2003 experienced the downside of this. It’s noteworthy that the Green Party which has long supported ranked choice voting so that there could be oxygen in the American electoral system for their politics failed to make a single endorsement, much less three for Treasurer, Assessor and City Attorney. Non was the operative ranking principle. 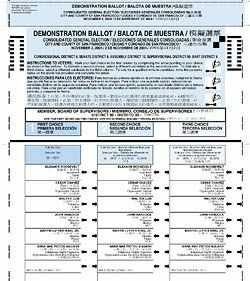 San Francisco lacks a comparative study of which groups experience a disproportionate number of exhausted ballots. A bona fide study could help the Department of Elections meet its responsibility to educate voters on how to use IRV, and where to target its public education campaign. Campaigns seeking second place votes would have a better idea on where to target their efforts. The Mayor, Board of Supervisors, Board of Education, Public Defender, City Attorney, District Attorney and Treasurer all make appointments to the Elections Commission and have a real voice in whether such a study takes place. We have two separate elections across the City now to study this question. At present there is only conjecture on who knows how to use IRV and who doesn’t. 1) When Lyndon Johnson received 49% of the vote in the New Hampshire Democratic primary in 1968 to Gene McCarthy he was finished. Tet was the stimulus, and he failed to win a majority. Getting below 50 percent of the vote for an incumbent is a historical marker of vulnerability. It certainly was for Mayor Brown’s appointees who faced City voters in December 2000. Pollsters consider it essential for incumbents seeking re-election to have majority support for re-election. So far under IRV we have incumbents getting well below 50 percent and even into the low 30 percent range on the first pass being re-elected under IRV. A frontrunner in a supervisor contest was successful with under 30 percent support in the first pass. This could be what voters want or the consequence of moving the contest forward, and the loss of time for voters to learn more candidates and issues. The sharp focus of a two- person race is not present in these multi-candidate fields. If this pro-incumbent bias holds it will deter candidates from entering races, and retard electoral competition. Potentially it represents an even great barrier to electoral competition than any Machine known to this town. If electoral competition only takes place when there is an open seat, this will be a huge loss for citizens seeking a voice in their local government. How good a job is IRV doing in terms of producing democratic outcomes with the greatest number of voters? In 2004, no supervisor in a contested race triggering ranked choice voting won a majority of the total votes cast in their districts. In multiple candidate races, supervisors were elected who received well under 40 percent of the total votes cast. While it is true that more voters participated in these contests than in December runoff elections, it’s a long way from the majoritarian promises. It may another sober fact of life that it is not possible to have a majority of the electorate determine the makeup of the San Francisco Board of Supervisors, independent of the voting system used. 2) Negative campaigning. It was a vote winning argument for Proposition A but it’s a myth. In fairness, hit pieces often perform a service to the electoral process. They hold individuals who will pass laws, appropriate public funds and play an important role in shaping local debate to account. They also are a major deterrent to all kinds of bad habits. But there is no evidence IRV is stemming the flow of hit pieces. In the 2004 supervisor contests Districts 1, 3, 5, 7, 9 and 11 all witnessed negative campaigning. Some negative campaigns used robo calls, others used the mail while others used both. The District 1 race broke new ground with negative street signs. In this year’s contests, there were hit pieces. Negative campaigning is basic to our politics and no voting method is going to eliminate it. City voters have placed boundaries on hit pieces because they often backfire, even ones that are well written can result in electoral blowback. San Francisco journalism under the influence of Warren Hinckle perfected its own style of the hit piece. It is the kidney chop that puts things neatly into black and white categories and doesn’t let too many facts stand in the way. Well written, critical exposes in the Chronicle or San Francisco Weekly today are just as deadly to candidates and they don’t involve the electoral downside to the beneficiary, which is common with campaign or IE driven hit pieces. IRV won’t change that. IRV is simply a voting system. It gives the electorate a new set of tools, but it asks an enormous amount of voters, news organizations and endorsement groups. The jury on this San Francisco experiment is still out, but IRV to date falls short of its backers expectations.